Don’t miss out on the UNFORGETTABLE SUMMER EXPERIENCE!! SIGN UP NOW!! You don’t want to miss this year’s fun! We are geared up and ready to make summer camp 2019 one of the best summers yet! Our program is packed with awesome games, crazy counselors, action packed days and much more. Find friendships that will last a lifetime, hear bible lessons that will penetrate your heart and have more fun that you can imagine! Join us this summer for another action packed experience! OPEN HOUSE: SUNDAY MAY 5TH…..3:00 – 5:00 PM. Meet some of our staff, walk around facility and pick up your camp shirt. You can also register on this date! Registration should be completed and mailed to our office by June 1st 2019 to guarantee your child’s enrollment. We will continue to take registrations past this date, however some weeks may fill up and have to be closed out! Register ASAP to guarantee your spot! Bus spots are first come, first serve! Registration fee is non-refundable and DOES NOT come off your first weeks payment. Mocksville Pick Up/Drop Off – Mocksville pickup/drop off will be at the Davie County Public Library Parking Lot. It will be on a first come, first serve basis. Please call ASAP to reserve your child’s spot on the bus! Morning Pick Up with be 7:45 – 8:00 am and Drop Off will be from 5:15-5:30. There is an additional $10/week or $2/day fee for this service. Please include in your regular payment. Advance Pick up and Drop off – Advance Pickup/drop off will be at the Bermuda Quay Shopping Center in Advance. This is a first come, first serve basis. Please call ASAP to reserve your child’s spot. Morning Pick up will be from 7:45 – 8:00 and Drop off will be from 5:30-5:45. There is an additional $10/week or $2/day fee for this service. Please include in your regular payment. Weekly Schedule: A newsletter will be EMAILED the week before your child is scheduled to attend. Please contact our office with questions or concerns about schedule. YOUR PAYMENT for tuition will also be emailed Friday before your week of summer camp. You can follow the link and pay online anytime before Camp begins on Monday. If you prefer to pay with cash or check please make payment Monday morning of your campers week of camp. Mondays: This is a day to get the campers acclimated to the camp facility and to get to know their counselors. Crafts and other activities will begin on Monday. Archery and Boating are offered every Monday (unless there is bad weather). Wednesdays: Craft Day…Campers will have a chance to show off their crafting skills with our fun craft options (example…water gun painting!!). We try hard at finding crafts that are suitable for each age group. Our older students will have the opportunity for more challenging crafts. Fridays: Friday we offer boating and archery. Other special events and activities usually occur on Fridays (special snacks, talent shows, competitions, etc.) MOVIE day…We usually show a movie for each age group on Fridays. Students can bring pillowpets/pillows, etc (must be able to fit in their camp cubby) to have during movie time (usually 1hr long). 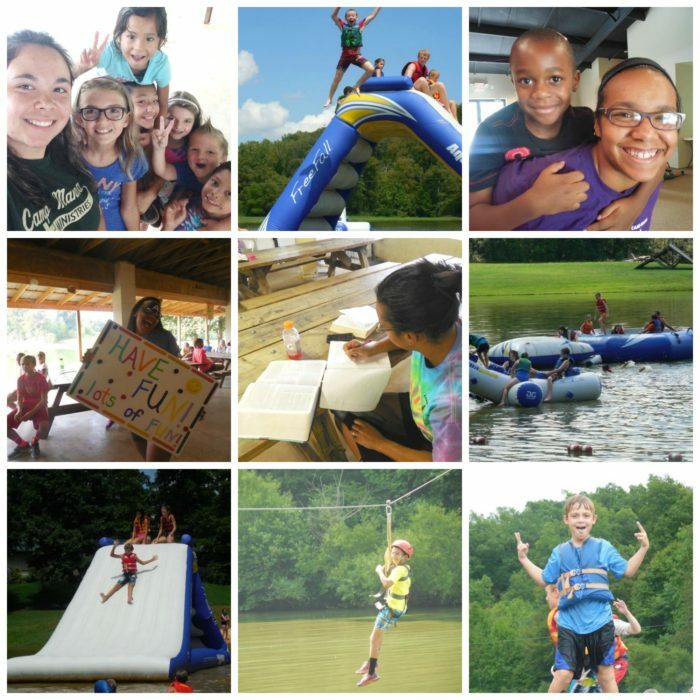 EVERYDAY: Everyday, campers will enjoy all kinds of activities around the camp, participate in Game Time, hear incredible truths from God’s word and be encouraged to display strong character skills. Regular Camp Activites include: Archery, Canoeing, Paddle Boating, netting, game time, group challenge time, devotions, crafts, etc. Campers will participate in these activites at various times throughout the week. We have devotions everyday! Week ONE (June 10th-14th) Aloha to SUMMER– we’re kicking the summer off with a week filled with some Hawaiian fun as we jump into God’s word and see how important a relationship with Christ is. Week TWO (June 17-21) Wild West Fun – We’re spending this week kickin up our boots and learning how to combat bad decisions. Cowboy up and learn how to be a true Champion for Christ. Cost $125 (1 camper) $240 (2 campers) **bus riders plus $10** EXTRA FEE FOR FIELDTRIP INCLUDED IN PRICE ABOVE. Week THREE (June 24-28) Color Wars– We hope you’re ready for a blast of Color…We’re coloring the camp (and campers), with a lot of paint, and a WHOLE LOT of making your life colorful with the Word of God. Special Activities: Color Run through the woods, TYE-DYE t-shirts, Fun games with Color!! Week FOUR (July 8-12) – X-GAMES This week if filled with crazy games and crazy stories from the bible. God’s word is filled with extreme measures God took to show his power and love. Cost $125 (1 camper) $240 (2 campers) **bus riders plus $10 ** EXTRA FEE FOR FIELDTRIP INCLUDED IN PRICE ABOVE. Week FIVE (July 15-19) X-Mas in July– We’re ringing the bells and brining Christmas to Camp in July! We are going to focus on Missions, Why was that Baby in Manger such a BIG DEAL and Pack Christmas Shoe Boxes for Samaritans Purse and Much MORE! STUDENTS WILL RECEIVE MORE INFORMATION ONCE THEY REGISTER. (extra $25 for the campout). We will spend the evening with lots of fun games around the camp. Glow in the dark capture the flag, bonfire, FOOD, tons of snack foods, great middle school based devotions and lots of growing in the WORD! Your middle school camper doesn’t want to miss out. A things to bring list will be emailed to each camper, along with an additional information sheet for parents! Week SEVEN (July29- Aug 2) – Around the World in 5 DAYS – We’re taking off for a trip around the globe. Learn about Missions, Taste snacks from other countries and participate LEARN why sharing our faith is so important! Week EIGHT (Aug 5-9) – Let’s S’WET– It’s water week so plan to be SOAKED!! Learn how God uses Water in the bible to show his POWER! Week NINE (Aug 12-16) – 5 G– Make Sure you get CONNECTED with Christ before you head back to school. We’re spending this whole week focusing on how we should live, who God is and why we need to read our bible~! We’re Taking a break from our traditional week of tournaments…we will still have ALL our normal fun Camp Activities and some tournaments will be throughout the summer. If you miss it, let us know, we might bring it back next summer! Friday: END OF SUMMER CELEBRATION / PIZZA FOR LUNCH/ TROPHY HANDOUTS! ** All fieldtrips and themes are subject to change due to weather or scheduling issues. Please check with counselor on Monday to verify any changes or call our office. NEW IN 2018 – We have purchased an indoor mobile unit that will become another spot of indoor space & craft room. We are VERY excited about this new addition to our facility. We hope the campers will love this new space! Improvements made to bathrooms and various other areas of facility. NEW IN 2017 – We have completed new changing rooms for swim time, purchased new lake equipment, purchased new zip line equipment and purchased new sporting gear. We have added a NEW kids (12 and under) obstacle course that will challenge your ninja warrior to overcome each obstacle with fun! NEW IN 2016 – We have completed our NEW LOG BUILDING! We are super excited about the additional indoor space and can’t wait for the campers to see it! We have added some sidewalks around the camp, water fountains and purchased new play equipment! NEW IN 2015 – We have completed several small projects around the camp. We added a wrap around porch area to our arbor which has provided some much needed extra shade for the summer! We purchased another activity bus and 15 passenger van to help with transportation. Much needed roadwork was completed by adding piping and drain systems to our road! New lake equipment purchased for the summer! NEW IN 2014 – We have a HUGE custom built playground! 4 slides, cargo climbing net, climbing wall and more! We also purchased a new 15 passanger van! Our arbor can now be enclosed during the winter months with custom built tent walls! We are still planning to start construction soon! Our newest construction project is another large indoor facility. We look forward to having more indoor space! NEW IN 2013 – Zip…Zip…Zipping Away!!! Our ZIPLINE is open! If you dare…take the challenge up to Salvation Station, harness up and zip down our over the lake zipline. It’s fast and fun. It a great view of Camp Manna suspended in air. Don’t worry we have a large sand pit waiting on the other side to cushion your landing!! The ampitheater is completed!! We have held a few events and several weddings in our beautiful ampitheater!! Praise the Lord for His faithfulness in completing this project. NEW IN 2012 – We are almost finished with our ampitheather! It will be completed in July 2012!! It is in a beautiful location by the lake. It will have large grass sections walled by decorative stone and will seat over 400 people! We are hoping to finish our zip line as well, please praywith us! NEW IN 2011 Swimming Area!!! We have spent the winter doing major upgrades to our lake!! We have graded out a large area to be designated as our swimming area. We’ve had sand hauled in to provide a beach area and are installing a lifeguard stand. The saturn ball, water trampoline and the “Blob” have been moved and re-anchored! NEW RECREATION BUIDLING COMPLETE!!! We are very excited to announce that our newest construction project “Recreation Building” is complete. This is our first indoor facility.